A tribute to Freddie Green. Musicians include Jeff Hamilton, Jeff Clayton, John Clayton and Freddie Green. Super Bass has been a dream of mine longer than I can remember. 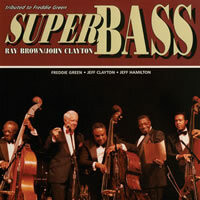 Back in 1945 I did One Bass Hit and in 1946 I did Two Bass Hit. All that time I had thoughts of doing the Triple and the Home Run. Well I guess Super Bass is a fulfillment to those two. First of all I had this young student that returned from studying at Indiana University as a complete "wizard" of the bass. He also was studying conducting and arranging and will be one of the top arrangers in the music business. His name is John Clayton and he is a major part of this album. The LP edition has been remastered by Doug Sax off the original master tapes through custom tube electronics. Pressing done by Quality Record Pressings on 200 gram of pure virgin vinyl. This album was produced to the same standards of all Analogue Productions LPs.